There are a million reasons why people love or hate Wes Anderson film's but one thing I think we can all agree on is that the music found in his films are as memorable as any script, actor performance, or eye candy captured by his camera. 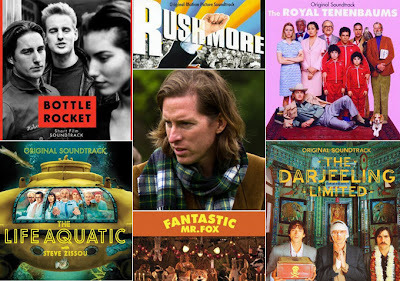 In short, the music of Wes Anderson films are as powerful and meaningful as the movies themselves. People tend to give Anderson or his co-writers all the credit for these soundtracks but in truth there are two other men who truly deserve the applaud for the bulk of his work: Mark Mothersbaugh (score composer and yes, the guy from Devo) and Randall Poster (music supervisor - my hero!). What this means is while Wes Anderson has his specific tastes in music and vision for how each film should sound, these other two men (and the list of helpers has expanded in recent years) bring his vision to life. Mark creates music especially for his film (AKA the score), often working on these songs as Wes casually sits near by on a couch working on the script. And Randall's job within the film has many layers, he doesn't just find the right music to fit the story and characters but he then places it in the right places within the film, and then something that is perhaps the least glamerous aspect of this job, securing the rights to use that piece of music in the movie. Licensing the songs is a critical and difficult task that requires detective work and some serious social skills as occasionally the perfect song was written by band that has long broken up and the band members haven't spoken to each other in years and want to keep it that way. Tonight from 7PM to 9PM on WRIR (stream it live at the link) I will be playing music from all of Wes Anderson's films as well as going into greater detail about the people who help him create some of the best soundtracks in history of film. I will speak a little about Anderson's cinematic influences (imagine that - director's who also use music impeccably!) but most importantly, you will hear two hours of top shelf music. Wes Anderson's power trio makes the best music mixes on the planet and I am happy to organize it all into one show for you. If time allows, I will also play a handful of songs that I have deemed Wes Anderson soundtrack worthy - things from my personal collection that I have always thought sounded like they belong in one of this films.